The Dialogues in Planning Speaker Series within the UTSA College of Architecture, Construction and Planning (CACP) continues with Dr. David Hagy of Texas Central Partners LLC. 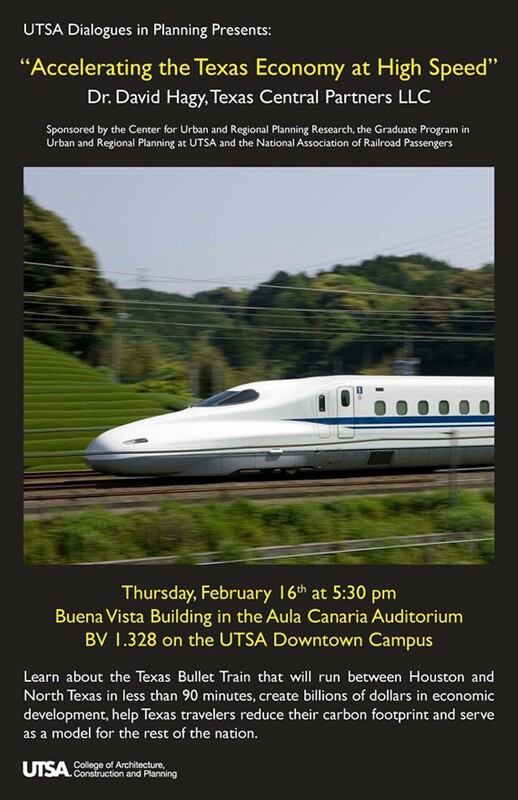 Dr. Hagy will present an update on the status of the privately developed Texas Bullet Train that will run between Houston and North Texas with a stop in the Brazos Valley. The train will travel between the two regions in less than 90 minutes, create billions of dollars in economic development for the state, help Texas travelers reduce their carbon footprint, and serve as a model for the rest of the nation.